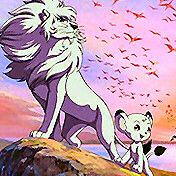 After the success of the original Kimba the White Lion/Jungle Emperor TV series, there have been two Kimba movies (in 1966 and 1997), a sequel TV series (known in English as Leo The Lion), a made-for-video film (The Symphonic Poem), an entirely different version on TV in 1989-1990 (known in English as The New Adventures of Kimba), and a new TV production in 2009. Below you'll find links to pages about each one, and links to buy the DVDs, if there are any. Something on this page was changed on 29 March 2012.